Brigadier General Frank McSherry was born on October 18, 1892 in Eldorado Springs, Missouri, and died on September 17, 1977. He enlisted in the army on May 12, 1917, and was discharged on December 31, 1946. He attended Colorado College and the University of Arizona where he earned a B.S. in Mathematics in 1916 and a B.S. in Mining and Metallurgical Engineering in 1917. He also studied French and Political Science at the University of Paris, and Electrical and Mechanical Engineering at MIT. He was married to Elisabeth Jones McSherry, and had four children. At the start of World War II, McSherry was stationed in Washington, D.C., in the War Department where he took part in the Federal Security Agency, National Defense Advisory Committee and the War Manpower Commission. He developed or took part in developing programs such as the War Department program for training civilian mechanics for war industries, which was later used during war, the National Defense Vocational Training Program which was used in all of the states, and the Training Within Industry Program. General McSherry was responsible for writing policies, directive and instructions for the Allied Military Government for Sicily. He later wrote proposed directives of the combined Chiefs of Staff for France, Belgium, Luxembourg, Denmark, Norway, the Netherlands, Germany, and Austria. After landing in Sicily, he and his staff set up postal, educational and railroad systems, as well as other governmental departments like agriculture, banking, and courts. 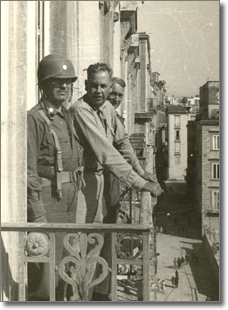 And while in Sicily, General McSherry and his team had several other duties, including preventing the Germans from accessing bank funds as well as assets in other countries, seeking out the gold stocks that the Nazis had hidden, restoring police and court systems, reorganizing unions and insuring social security, and commencing the creation of emergency food and shelter programs. In December of 1943, Palermo University awarded General McSherry with an honorary Doctor of Law. In 1945, the University of Arizona awarded him with the Alumni Achievement Award. His military education consisted of the Battery Officers Course, the Command and General Staff School, the Advanced Gunnery Course, and the Army War College. He served the United States for more than 39 years, before retiring in 1946. Brigadier General Frank McSherry was decorated with various awards and achievements. He was awarded with the Army Distinguished Service Medal for his actions during World War II from December 1944 to June 1945, as Deputy Assistant Chief, Supreme Headquarters, Allied Expeditionary Force, G-5 Division (SHAEF, G-5). He was also awarded with the Legion of Merit, Bronze Star, and the War Department General Staff Insignia. General Frank McSherry in the middle. From the Municipal Historical Archive.